MoroccanOil Questions? ….It is for everyone! MoroccanOil hair products are among the best on the market in terms of having quality ingredients that positively effect your hair instead of stripping it and leaving it damaged. The Original Moroccan Treatment revolutionizes how the hair looks and feels after only a few treatments. It leaves hair healthy, silky and shiny. This is the treatment that many other hair products have tried to imitate but have not been successful with. 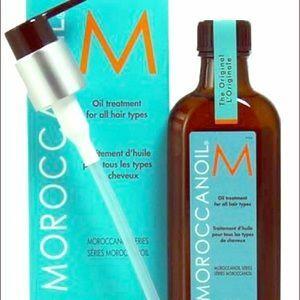 The Original Moroccan Treatment stands alone as a pioneer in hair care because of its quality ingredients and results. MoroccanOil’s Thickening Lotion for fine to medium thickness hair is a fast working protein blend made from natural quinoa and works to thicken every strand of your hair for an immediate expansion and a lot of body. Vitamins and argan oil complete the look for shiny hair that begs to be touched. The unique Dry Shampoos with dark or light tones from MoroccanOil are wonderful products and meet a real need with customers who are sometimes stressed for time and need a product that will provide fast results without compromising quality. MoroccanOil launched this product due to the overwhelming demand from its customers who requested that they offer a natural formula in a dry shampoo. The results are two excellent products, one for dark and one for light hair tone. A combination of fine rice-starch absorbs oil and odor, leaving the hair very clean and natural looking. MoroccanOil’s Hydrating Conditioner is like no other conditioning product out there. With superior detangling ingredients, it moisturizes and hydrates the hair strands with a gentle formula that can be used after every shampoo. Generously infused with argan oil and vitamins A and E, the formula also contains red algae to provide hydration. This is a sulfate and paraben-free product that customers love. For a great boost in your hair’s foundation, the MoroccanOil Root Boost provides volume with lift. The product gives hair a very strong foundation for roots before using heat styling. The result is a high volume and thickness that creates a long-lasting style with both full body and natural movement. The infusion of argan oils helps to minimize the static issue. MoroccanOil’s Glimmer Shine product offers a unique combination of ingredients that delivers the perfect finishing touch to any hair style. The fine finishing spray not only attracts light to the hair, but reflects it to give off a gorgeous glossy appearance. The formula of argan oil, vitamins and antioxidants blend to create what the company calls an invisible veil of pure shine. The ingredients also protect the hair against many environmental elements that can cause damage. This is an alcohol-free product. The wide range of products that MoroccanOil offers truly has something to meet every hair type and individual customer need. The company offers many other types of hair care products as well, such as natural hair brushes, scalp treatments and an entire body line apart from their hair care. Previous Previous post: Curly Hair Mistake!